The demonstrators called on international organizations to immediately react to savage attacks on Yemen and help end the conflict. Iranian people from every walk of life held massive protests across the country on Friday to condemn the Saudi regime’s military attacks on Yemen, which have killed hundreds of women and children so far. The nationwide protests against the Al Saud regime’s onslaughts on Yemen were held in the prayer grounds in the capital, Tehran, and more than 770 other cities following the Friday Prayers. 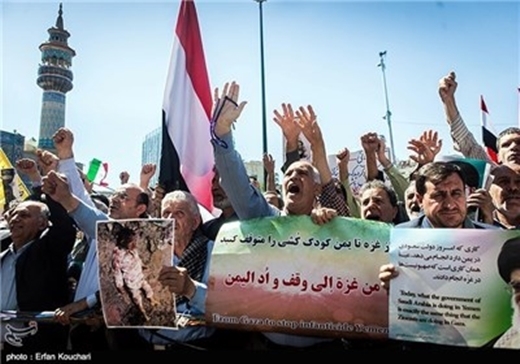 Chanting various slogans, such as “Death to America”, “Death to Israel” and “Death to AL Saud”, the Iranian worshippers voiced their outrage at the killing of “defenseless and oppressed” people of Yemen by the Saudi-led coalition. The demonstrators further called on the international bodies, the United Nations in particular, and human rights organizations to immediately react to the “savage attacks” on Yemen and help end the conflicts. The rallies came as Saudi Arabia announced a five-day ceasefire in the war it has waged against Yemen. The ceasefire came after several humanitarian organizations criticized the Saudi regime for blocking air, land and sea routes into Yemen. In one instance of such attempts, fighter jets of Saudi Arabian-led coalition bombed the runway of Sana’a airport on April 28 to prevent an Iranian plane carrying aid cargos from landing in the Yemeni capital. The Saudi-led coalition announced on April 21 that its military operation “Decisive Storm” has ended, but hours later, airstrikes and ground fighting resumed. According to the spokesman of the Yemeni Army, the Saudi-led war on the Arab country has killed more than 2,000 people, most of them civilians.